Elected HDP officials in exile issued a call for action in front of the CoE on the second day of their demonstration to support Leyla Guven, who has been on a hunger strike for 77 days against the isolation. HDP former MPs, co-mayors of several usurped municipalities and party administrators have been holding a demonstration in front of the Council of Europe (CoE) for the last two days as the Parliamentary Assembly of the Council of Europe (PACE) sessions continue. The elected officials are also on a 4-day hunger strike to support DTK Co-chair Leyla Guven and the activists on unlimited nonalternating hunger strikes against the isolation, and held a demonstration today between 08:00 and 10:00 in the morning. 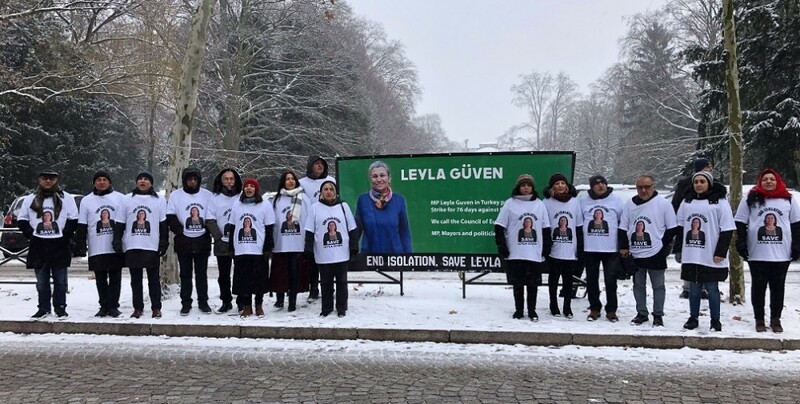 The HDP officials pointed to Leyla Guven’s health on the 77th day of her hunger strike and held a banner that read “End the isolation, save Leyla Guven”, frequently chanting slogans calling for awareness. The exiled elected officials chanted “End the isolation, freedom for Leyla Guven” throughout the demonstration and demanded that the CoE and the Committee for the Prevention of Torture (CPT) take action, also passing out flyers informing the public about the issue. The exiled HDP officials will convene again at 15:00 in the same spot. There will be two daily demonstrations in front of the CoE until Friday.